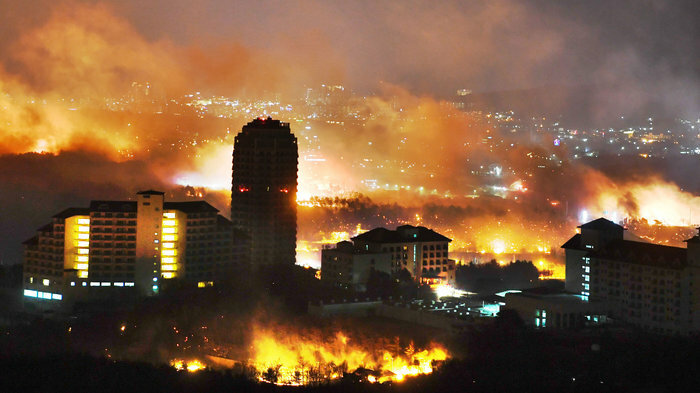 Our thoughts are with those impacted by these tragic wildfires in South Korea. South Korea is using its military to contain a large forest fire that spread quickly after igniting in Gangwon Province, along the country's east coast. Strong winds moved the blaze from city to city, prompting President Moon Jae-in to declare a national emergency. It's being called the worst wildfire to hit South Korea in years, forcing thousands to evacuate and ravaging rural towns. Fire officials are reporting two deaths, according to the Associated Press. In Gangwon's national forests and other woodlands, fires are common in the spring — but they usually don't spread so quickly, and they're usually confined to unpopulated areas, residents tell the Korea Herald.